More than 100 newsroom and media industry leaders gathered at the Newseum Tuesday for the second Power Shift Summit to explore what’s changed since #MeToo revelations exposed sexual harassment and misconduct in many news organizations. Last year’s summit examined the systems and silence behind the scandals and discussed solutions to create safer, more equal and diverse newsrooms. Tuesday’s focus was on what’s changed since last year and who’s leading the way, and untold stories about harassment and discrimination that still need to be covered. “Last year, we listened to the diversity of voices in the room and we heard that imbalances of power and corrosive behavior too long tolerated had left a trail of damage in our industry,” said Cathy Trost, executive director of the Freedom Forum Institute. 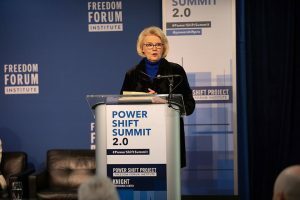 The Freedom Forum Institute, the programs and education partner of the Newseum, launched the Power Shift Project as an industry-wide initiative to improve the quality and future of journalism by creating workplaces free of harassment and discrimination, and full of opportunity, especially for those who have traditionally been denied it. “We made a commitment to use our resources as a catalyst for change,” said Jan Neuharth, the chair and chief executive officer of the Freedom Forum, and trustee of the Freedom Forum Institute and Newseum. After last year’s media scandals, many participants at Tuesday’s summit said their newsrooms had a heightened awareness of the issues and took a much closer look at their own systems and culture. But many also noted there are not enough women and diverse representation at all levels of the news media. They said organizations need to make stronger efforts to find pathways for women and people of color to advance in the news business. Chai Feldblum, a former Commissioner of the Equal Employment Opportunity Commission, encouraged participants to pay attention to risk factors for harassment in their workplace. An EEOC task force’s landmark 2016 study on Harassment in the Workplace, includes a chart of risk factors: a homogenous workplace, a young staff and a workplace with “high value employees,” among others. The conversation focused on critical concerns about the intersection of harassment and discrimination. Women and women of color, in particular, face escalating online harassment and abuse. Participants noted the tension between news organizations’ interest in promoting their work and building brands versus exposing reporters to threats and verbal attacks in the digital world. The Assignment Desk session at the summit focused on the many stories of sexual misconduct and discrimination which still need to be told through the lens of journalists who have broken stories and experts in the room. Ideas and resources about under-covered stories across all industries will be available here. Participants in the room joined more than 200 people watching the program via livestream. Clips from the program can be watched here, or explore the live blog and view photos here. In the past six months, the Power Shift Project launched the Workplace Integrity curriculum as a unique training tool for media organizations. The curriculum was developed by Jill Geisler, a veteran broadcast journalist and internationally recognized expert in leadership and management. More than 70 people have been trained so far to deliver the curriculum in their own news and journalism-related organizations. The Workplace Integrity “Train the Trainers” workshops led by Geisler are available to individuals in the news industry and related journalism educational organizations who will deliver the training in their own organizations. Thanks to a grant from CBS Corp., qualified applicants receive underwritten tuition and travel support to attend the workshops. For more information and to apply, click here. A comprehensive report on Power Shift Summit 2.0 will be posted soon. Follow the Power Shift Project on Facebook and on Twitter @powershiftpro for the latest updates. This entry was posted in News and tagged Power Shift Project, Power Shift Summit, Power Shift Summit 2.0 by Power Shift Project. Bookmark the permalink.